Eli had his 4th birthday in February and we celebrated at Grandma and Grandpa Bentley's house a few days before. We made a cake for Natalie Newbold too because her birthday was close to Eli's. I think Grandpa Bentley enjoyed the cake! on the 7th, his actual birthday we opened presents with our "little" family. I love the head tilt this kid does! Hyrum likes doing our tradition with the presents. Eli got a new coat for his birthday. the kids had Eli close his eyes for this one because we couldn't wrap it. in February Joseph did his biography book report. He did it on Orville Wright, one of the Wright brothers. He had to dress up as his character and give the report as if he was Orville Wright. He did a good job! 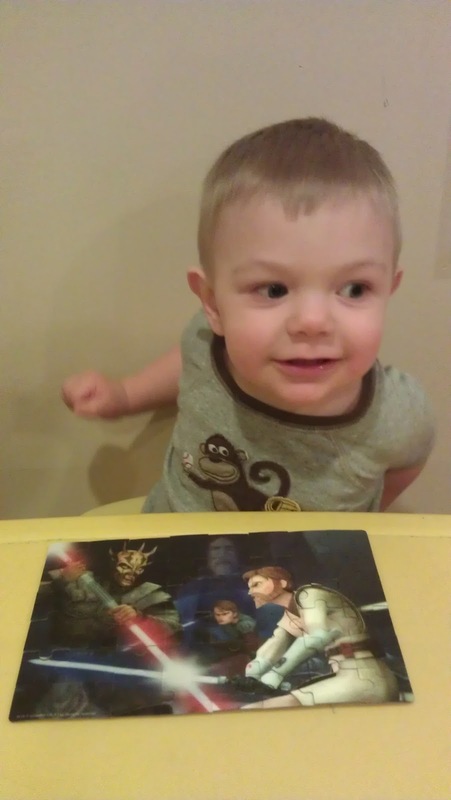 This is Eli's birthday card from Grandma and Grandpa Bartlett and Jarom. on Valentine's day the doorbell rang before the kids had left for school and they each got a valentine from Grandma and Grandpa! We had a lot of flowers for Valentine's day! Nate gave me the bouquet on the left, I bought the one on the right for him and the kids to share and the rose in the middle was from...I can't remember what it was from! Oops! These flowers lasted so long, it was great! 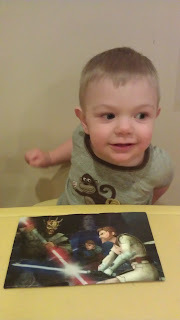 Eli got a puzzle for his birthday and Daddy helped him put it together one night while he was watching the kids for me. 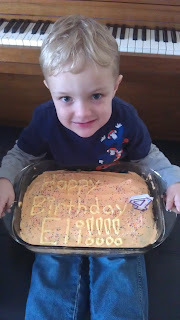 More cake for Eli! We got together with the Bartlett's for birthdays too. In February, Joseph earned his Wolf badge! February 2011 started with Eli's birthday! 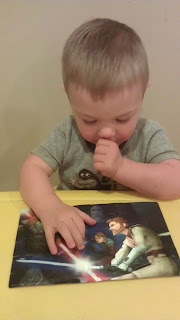 Our sweet boy turned 3! Has the birthday boy had enough? Eli was so sweet and kind to Hyrum and would often lay down by the baby while I changed him to help keep him happy. Hyrum is ready to go in the car. Kate loves bringing stuffed animals where ever we go. Nate performed in the city's Valentine's Cabaret and my parents came to sit with me in the audience. Here Nate is singing "I'm an Ordinary Man" from "My Fair Lady"
He played an old man along with Deb as an old woman. It was really funny! 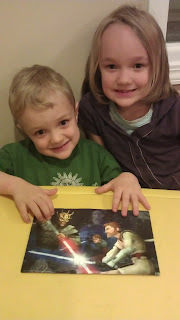 Valentine's day was in the middle of the week so we had our date after the kids were in bed. We had sparkling cider in nice glasses. Nate gave me these beautiful roses! and this arrangement was leftover from the cabaret. Joseph made these flowers at school. This was Nate's Valentine's gift to me, gift certificates to Ruth's Chris steak house! and this was my gift to Nate, a cloud print Snuggie! Kate's cute Valentine's bag from Kindergarten. Kate's friend Blake made these for all the kids, cute huh! The program for the Valentine's Cabaret. We watched Eclipse on our date, it's not my favorite movie, but it was good. February is the Cub Scout Blue and Gold dinner in our ward. I was assigned that year to make a campfire. I had the wolves in my den roll up newspaper and paint them brown and then I hooked them all together with twisty ties and stuffed colored tissue paper down in them. I used rocks from my rock pile as the fire ring. It turned out pretty good! Baby Hyrum wondering what's up! Joseph got to go up at the banquet and be introduced as one of the new boys to turn 8 and enter cub scouts! February was the month that Isaac was invited by his friend Isaac to participate in a readers' theater the school was doing. Afterwards he said to me,"Mom, I wasn't scared one bit, I think I want to be in the children's play this year." I was proud of him, and later that year he was in the children's play and did a great job! 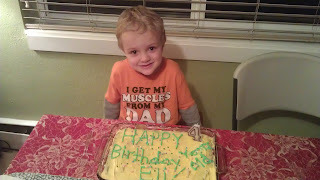 We celebrated Eli's birthday along with Lydia and Monica over at the Bartlett's. 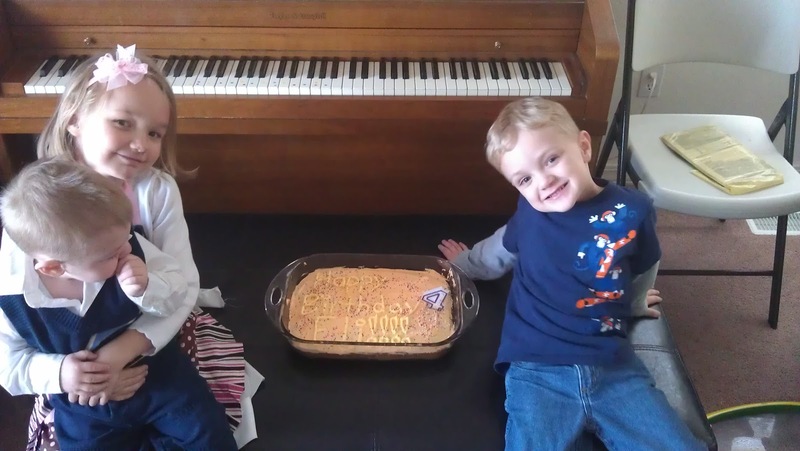 February brought Megan and Mason Schneider and their cute son Carson to our house. They lived in our basement for 3 months while Mason was doing his rotations in Salt Lake. Carson really liked baby Hyrum! Nate and I decided it was the right year to take our kids to Disney Land. Isaac was 9 years old and when a child turns 10 they pay the adult price! We made our plans and bought the tickets and prepared to go. Megan and Mason arrived at our house just in time to house sit for us while we were gone! Hyrum started sucking his thumb about this time and it made driving in the car a lot easier for mommy! We left for Las Vegas on Friday after the kids got home from school. We drove until we arrived in the hotel about 11pm! Hyrum decided to start teething while we drove. The next morning we took the kids swimming at the hotel. It was Hyrum's first time and he fell asleep in the water. Joseph and Dad enjoying the hot tub. After breakfast and checking out of our hotel we drove to my cousin Cassie McBeth's house in California. They were so kind and gave us their kids' room to sleep in. The next morning was Sunday so we got dressed and went to church with them. Here are our boys playing trains together. and here are our girls playing together! Nate and the baby all ready for church. this picture makes me think of Cassie and Becky. So sweet! Cassie had just had a baby 2 months before. This is baby Julia. That night we packed up and Jared and Cassie drove with us to see the Newport Beach temple. It was beautiful in the darkness. Emmaline and Kate became good friends. It was really fun to see Cassie and really nice of her family to let us stay with them on our way to Disney Land. We arrived at our next hotel that night and woke up ready to go to Disney Land! My sister-in-law Christine, had a ton of tips we used for our trip and one of them was to have snacks for the kids to eat while waiting in line for the rides. What a brilliant idea! The boys trying to pull the sword out of the stone!